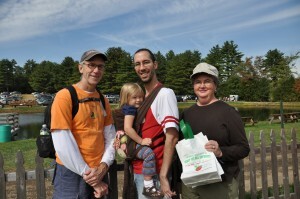 Sunday we went out apple picking at honey pot hill orchard in Stowe. It was a quintessential fall day, although a bit hot by the time we were done. We parked in a field, bought our bags, rode on a hay ride pulled by a tractor, saw some animals (chickens, goats, pigs, sheep, and bunnies), ate cider donuts and rode on the hay ride again before actually picking some apples. In the end, the actual picking was a very small amount of time. 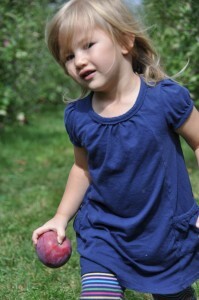 Josie got right into it and was super speedy at ripping the apples off the tree (video to come later). She picked our whole bag for us except maybe one apple. 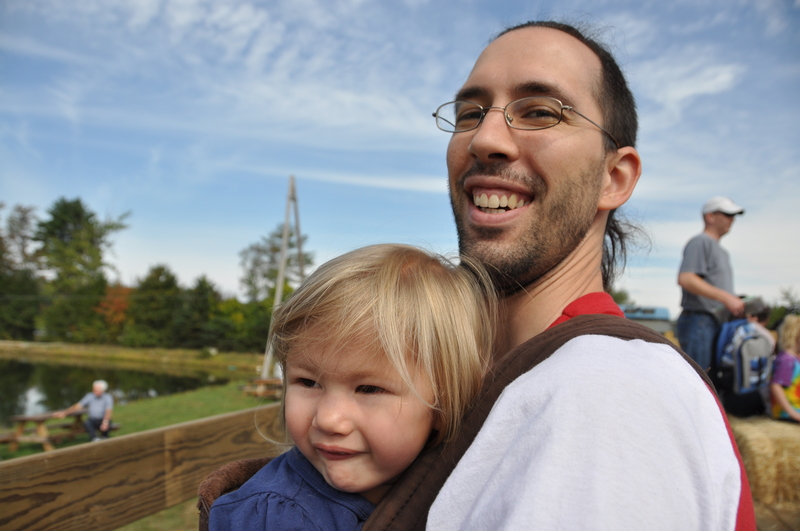 She was also unfortunately a bit under the weather as well and so Jordi carried her most of the time to help her conserve energy. We got home and dismantled most of the apples into crisp, pie and applesauce form. With one crisp nicely stashed away in my freezer for after the baby is here. Here’s a couple of photos of the beautiful weather and friendly people. This entry was posted on Friday, October 1st, 2010 at 8:55 pm by Jen. You can follow any responses to this entry through the RSS 2.0 feed. You can skip to the end and leave a response. Pinging is currently not allowed.